Not really knowing how far till we hit Edinburgh and in much need of a stop we randomly picked a town on the map for lunch. As we neared the town of Jedburgh we could see the ruins of Jedburgh Abbey and were not so hungry anymore. Our curiosity was all the more satisfied when we discovered it was a free weekend for entry and audio tour in the ruins. The Abbey was founded in 1138 by David I and housed the Augustine monks. 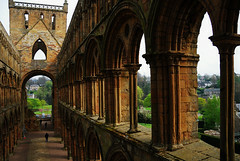 Given its close proximity to the English border and the frequent feuding between the English and the Scots, the abbey has been repaired a number of times. The levels of arches tell a story of gradual development as they move through the architectural styles, from mostly Romanesque and then to Gothic. The Abbey was ultimatley destroyed by Henry VIII and parts laid dormant under the town of Jedburgh before being excavated in 1983. Despite its current condition the abbey is still very inspiring. Also of note is Mary Queen of Scots house which is now a museum. Oh and Alison, we had our first chip buttie! New York is a must, very cool place and very easy to get around and enjoy. We could have spent a lot longer there, for example the NY Public Library could easily have occupied a full day, as could have Central Park and wandering through the shops down 5th avenue! Not long now and I will be back at the Union office and I dare say you will be off on one of your jaunts in no time!